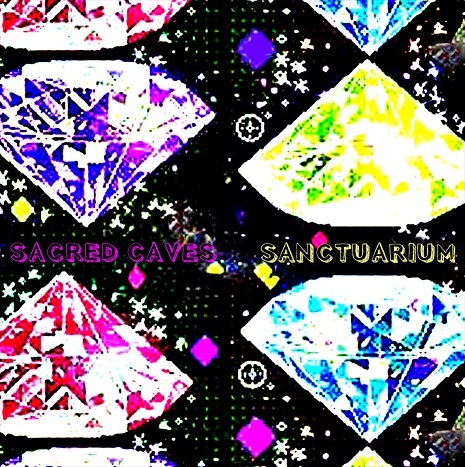 Sanctuarium is the first EP released by the duo known as Sacred Caves. It is a 4 track EP that is enchanting as well as amazing in it’s ability to make you feel like everything is okay. A little assurance that even though life isn’t the best, you can always enjoy the moment and make lemonade with the lemons. At the same time it also delivers an intimate feeling of the realities of life. Masterful bass lines throughout Sanctuarium are rhythmic with a soft tone that resonates. Energetic percussion involving both natural and electronic instruments fill the songs with interesting sounds and beats that are catchy and hard to keep out of the mind. The synths are right on cue with style and are just as energetic as the percussion. The guitar playing seems to be a bit over-shadowed but is excellent and typically keeps an inventive rhythm. However the last track on the EP, “Diamonds”, is an acoustic masterpiece on the guitar that both leads and is stunning. Sanctuarium is a great EP that really showcases the work of Greg Bertens and Nyles Lannon. Their collaboration has resulted in a great band that has potential to delight audiences everywhere. An album in the fall is predicted by the duo, and after Sanctuarium, an awesome album will be expected. Download Sacred Cave’s single, “On The Outside”.